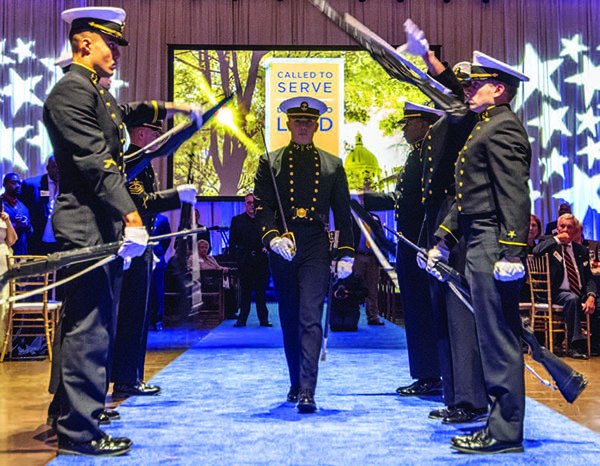 The Naval Academy alumni and friend community gathered in Annapolis 7–9 November to celebrate the launch of Called to Serve, Daring to Lead: The Naval Academy Campaign. Shipmate showcases milestone moments from the historic events. 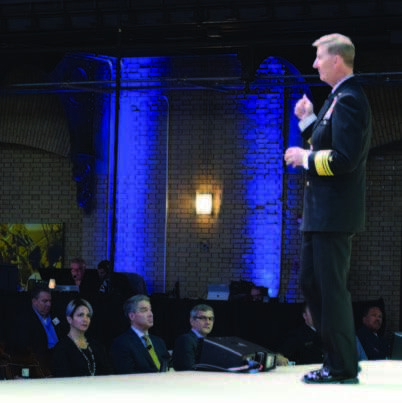 In those few lines, Vice Admiral Tim Szymanski ’85, USN, Deputy Commander, U.S. Special Operations Command, captured the spirit not just of today’s United States Naval Academy, but of the historic, groundbreaking $400 million campaign whose public launch was celebrated in events, programs and communications nationwide throughout fall 2018. Szymanski’s remarks came during his keynote address at the Annapolis launch celebration for Called to Serve, Daring to Lead, a two-day series of events in November that welcomed a wide range of donors, alumni, volunteer leaders and various members of the Naval Academy family back to Annapolis to better understand the connections between the campaign and the demands placed on the next generation of Navy and Marine Corps officers. Events ranged from Szymanski’s keynote to a series of panel discussions from alumni at different phases of their careers to an update from the Superintendent, to a pep rally, to a volunteer leadership summit designed to help class, chapter, parent club, shared interest group and other leaders and friends become stronger advocates for the campaign. The celebration’s centerpiece was an evening gala in Dahlgren Hall that featured an array of interactive stations showcasing projects and initiatives benefiting from Called to Serve, Daring to Lead, giving guests the opportunity to hear directly from midshipmen about the impact of their investment. “Tonight is a true celebration of all that’s been accomplished since the campaign began in 2012,” said Daniel F. Akerson ’70, chairman of the Naval Academy Foundation Board of Directors and co-chairman of Called to Serve, Daring to Lead, opening the gala event. Here are some of the most memorable moments from this milestone occasion (for comprehensive photo and video coverage of the Called to Serve, Daring to Lead launch celebration, visit www.usna.com/daringtolead). “If we think we have a technological edge because of the connectedness of the world, we have to realize the minute we employ something, the minute we start training on it, the minute we understand it, someone’s going to steal that technological edge and then the playing field is going to get flatter and flatter, quicker and quicker. The leaders of the future have got to be able to train their sailors how to use that advantage,” said Admiral Michelle Howard ’82, USN (Ret. ), former Commander, U.S. Naval Forces Europe/Africa and former Commander, U.S. Joint Force Naples. Howard and Admiral Cecil Haney ’78, USN (Ret. 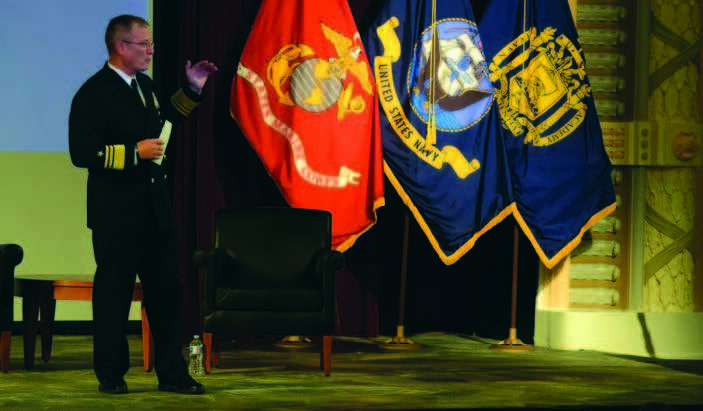 ), former Commander, U.S. Strategic Command, participated in a panel discussion moderated by Alumni Association Board of Trustees Chairman Admiral Samuel J. Locklear III ’77, USN (Ret. ), former Commander, U.S. Pacific Command, on the greatest challenges they’ve experienced and future challenges facing tomorrow’s leaders. 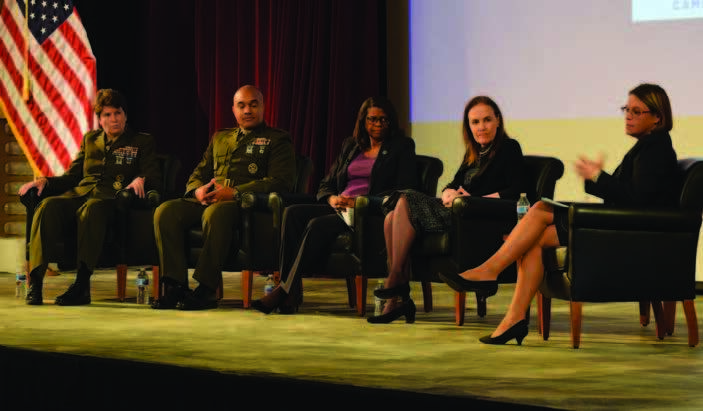 Another of the launch celebration’s panel sessions included alumni—and one parent—who have held a variety of positions in the Navy, Marine Corps, government service, industry and the Academy’s governing Board of Visitors. They included: Rear Admiral Cynthia M. Thebaud ’85, USN (Ret. 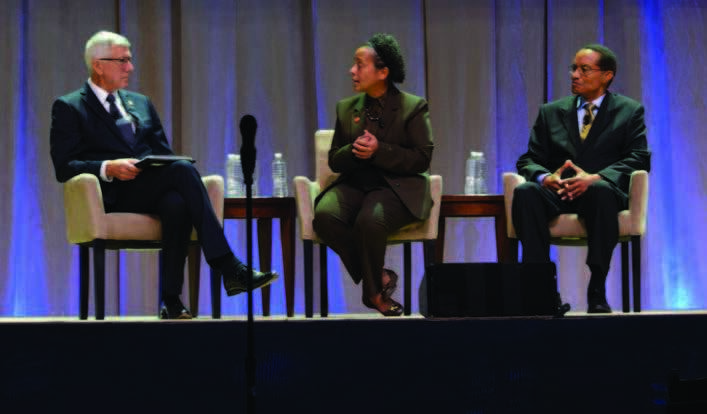 ), who retired as Commander, Expeditionary Strike Group 2, who moderated; Brigadier General Brian W. Cavanaugh ’90, USMC, Deputy Director for Operations, Joint Staff; Lieutenant General Loretta E. “Lori” Reynolds ’86, USMC, Deputy Commandant for Information; Matice J. Wright ’88 of the Board of Visitors and The Honorable Michèle Flournoy, parent of a Class of 2019 midshipman, recently joined the Naval Academy Foundation Board of Directors. “There can be no fracture in the investment in these principles: moral, mental and physical endurance. They do carry over, not only in service, but once you’ve transitioned. Those pillars in my mind are the foundation for me and my style of leadership. Those are the focus points where you ought to know yourself, always seek self-improvement and know the people that you lead. I got that foundation here, and I can’t emphasize enough that investment in these principles are critical.” said Cavanaugh. 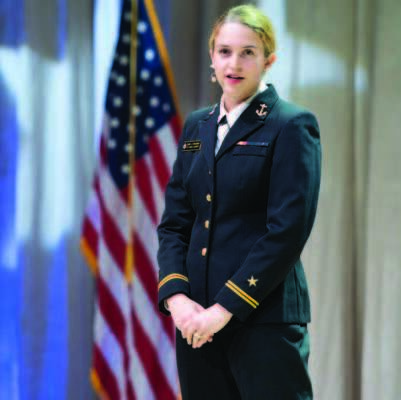 The gala showcased three midshipman leaders introduced by key volunteer leaders Admiral Michael Mullen ’68, USN (Ret. ), and Eric Grubman ’80, both vice chairs of the Naval Academy Foundation Board, as well as Captain Paul Tortora ’89, USN (Ret. ), director of the Center for Cyber Security Studies. Midshipmen Paul Dennler ’19 and Sydney Frankenburg ’19 shared their perspectives on leadership and the Academy’s cyber initiatives, while Fall Brigade Commander and lacrosse player Midshipman Ian Burgoyne ’19 talked about the impact Navy athletics has had on his midshipman experience. “I’ve been playing lacrosse since I was a little kid, and it’s had a tremendous influence on me, especially here at the Naval Academy. Time on the field has taught me a strong work ethic, teamwork, determination, self-sacrifice and being comfortable with failure. There’s been plenty of failure—which has taught me maybe even more than winning,” said Burgoyne. “In the heat of competition, when you’re focused just on the play or the game ahead, athletes don’t always realize we’re developing the skills needed to lead. Grace under pressure. Decisiveness. 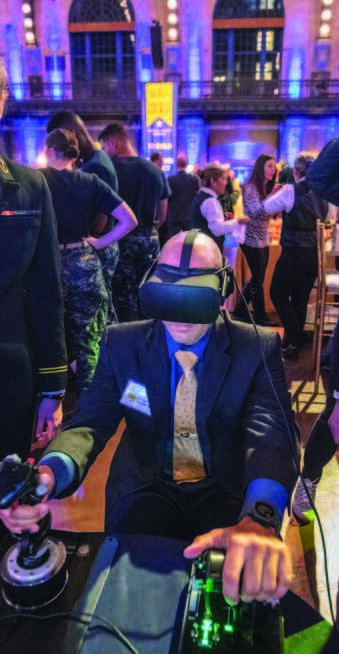 The floor of Dahlgren Hall offered guests an opportunity to mingle and have one-on-one interactions with midshipmen and faculty engaged in projects connected directly to Called to Serve, Daring to Lead’s priorities. The stations, grouped by themes “To Fight and Win;” “To Lead with Integrity;” “To Serve, Locally and Globally” and “To Build an Enduring Legacy,” included drone demonstrations, a cyber-attack heat map, a signal jamming exercise, images and artifacts from midshipman international experiences, model rockets, a National Outdoor Leadership School campaign expedition display, video loops of the Physical Mission Center and Alumni Association and Foundation Center project renderings and activities sponsored by the Academy’s Science, Technology, Engineering and Mathematics outreach programs. The gala’s entertainment focused on midshipman performers: The Highland Drums and Dancers, the Trident Brass, the Gospel Choir and the Silent Drill Team. Alumni Association and Foundation President and CEO Byron F. Marchant ’78 closed the evening with remarks inspired by their extraordinary skill, commitment and talent. Events continued on Friday morning with a panel discussion featuring alumni who have excelled in the business world: Huntington Ingalls CEO C. Michael Petters ’82, community leader and philanthropist David Robinson ’87; Chamberlain Group CEO JoAnna Sohovich ’93; Polaris CEO Scott Wine ’89 and moderator Greer Lautrup ’85, a partner with the legal firm Sidley Austin. Vice Admiral Ted Carter ’81, USN, offered an update on Academy achievements and objectives on Friday. The participation of Carter, who wraps up his fifth and final year as Superintendent at the end of this academic year, allowed guests to better connect the work of the campaign with the ambitious goals and vision Carter and other Yard leaders have established for the Academy. Friday afternoon offered an opportunity for class, chapter, parent and shared interest group leaders to gather and learn more about the history of philanthropy at the Academy and the unique dynamics of a dedicated campaign. Alumni Association Board of Trustees Vice Chair Major General Leo Williams ’70, USMCR (Ret. ); Naval Academy Foundation Vice Chair Eric Grubman ’80 and Alumni Association and Foundation President and CEO Byron F. Marchant ’78 kicked off a series of presentations from staff and volunteers designed to tackle different aspects of the campaign and the roles events, communications and other forms of engagement play in its success. 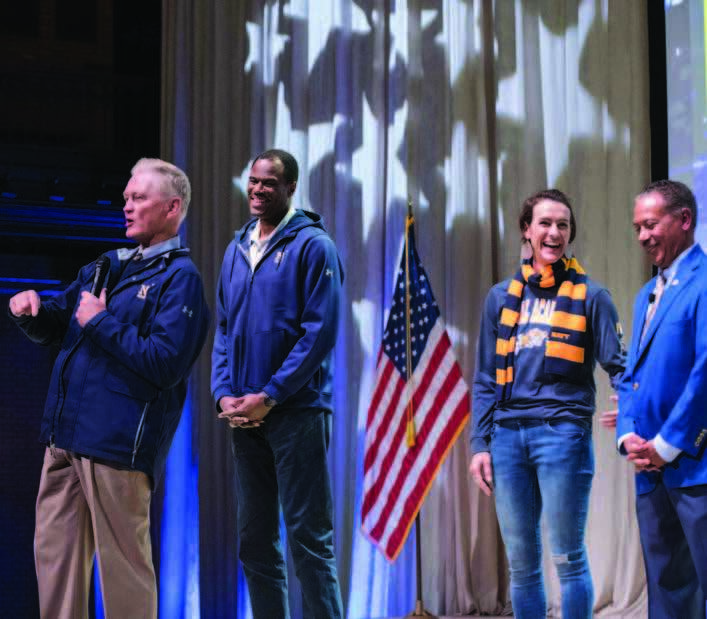 In addition to another chance to check out the interactive stations, Friday evening offered a Veterans Classic pre-game pep rally featuring Navy Athletic Director Chet Gladchuk and Navy basketball legends Commander Becky Dowling Calder ’98, USNR, and David Robinson ’87. Unfortunately, the Midshipmen lost to the University of Maryland Terps later that evening in the teams’ first meeting since the 1985 NCAA Tournament. While the November celebration marked several years of progress and achievements, it also signaled a new beginning to a broader, further-reaching effort that will include and affect all members of the Naval Academy family. Updates and announcements about the progress of Called to Serve, Daring to Lead will appear in upcoming issues of Shipmate, on usna.com, in WaveTops and in social media. Stay tuned for additional developments.